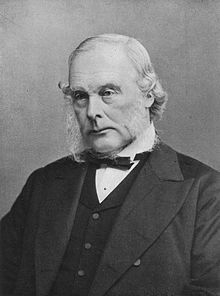 Joseph Lister, 1st Baron Lister, OM PC PRS FRS (5 April 1827 – 10 February 1912) was a British surgeon and a pioneer of antiseptic surgery. He promoted the idea of sterile surgery while working at the Glasgow Royal Infirmary. Lister successfully introduced carbolic acid (phenol) to sterilise surgical instruments and to clean wounds. 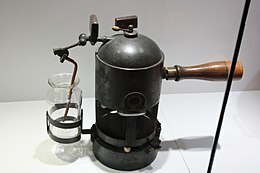 Applying Louis Pasteur's advances in microbiology, Lister championed the use of carbolic acid as an antiseptic, so that it became the first widely used antiseptic in surgery. He knew it was used to ease the stench from fields irrigated with sewage waste. He thought it was safe because fields treated with carbolic acid had no ill-effects on the livestock that grazed on them. Lister's work led to a reduction in post-operative infections (infections after an operation). This made surgery safer for patients. So he became known as the "father of modern surgery". ↑ Cartwright, Frederick F. "Joseph Lister". Encyclopædia Britannica. Retrieved 8 February 2018. ↑ Between 1883 and 1897 he was known as Sir Joseph Lister, Bt. ↑ Pitt, Dennis; Aubin, Jean-Michel (2012-10-01). "Joseph Lister: father of modern surgery". Canadian Journal of Surgery 55 (5): E8–E9. doi:10.1503/cjs.007112. ISSN 0008-428X. PMC 3468637. PMID 22992425. This page was last changed on 17 September 2018, at 10:13.